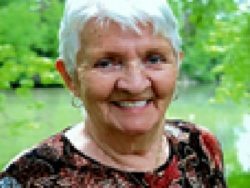 Elsie Scarrow - Heritage Funeral Homes Inc.
of Clifford passed away after a courageous battle at the St. Joseph’s Health Care Centre in Guelph, ON on Thursday March 14, 2019 in her 79th year. Beloved wife of the late Earl Scarrow (2019) for 60 years. Dear mother of Dan and Karen Scarrow of Waterloo, Donna and Maurice Beirnes of Listowel and Dayna Lambier and partner Greg Bast of Clifford. Grammy of Brittany and Bryce Scarrow, Megan and Lauren Beirnes, Rebecca and Hannah Lambier. Remembered by her sisters and brothers, Donna Scott (Roy Sutton), Bill and Barb Dyce, Judy Dyce, Jim Dyce, Andy and Patricia Dyce, Donna Dyce, Brenda and Ron Rooney, Audrey and Walter Peacock, Lindsay Dyce, Lynn and Rob Schmidt, John and Penny Dyce, Anna and Dave Langdon, Sister-in-law of Jack Scarrow. Fondly remembered by her many nieces, nephews and friends. Predeceased by her parents Emma and Frank Dyce, mother-in-law and father-in-law Ruby and Morris Scarrow, grand-daughter Emma Lambier, brothers Roy Dyce and Charlie Dyce, sisters-in-law and brothers-in-law Joan McTavish, Jack McTavish, Edwin Scott, Carol Scarrow, and Kathy Dyce. To honour Elsie’s wishes cremation has taken place. The family will receive family and friends at the Crawford Funeral Chapel, 243 George Street, Arthur, Ontario to celebrate the lives of their parents on Friday, March 22, 2019, from 2-4 and 6-9 PM. A memorial service celebrating Earl and Elsie’s lives will be held on Saturday, March 23, 2019, at 11:00 AM in the St. Andrew’s Presbyterian Church, 149 Frederick St E Arthur, ON. Spring interment will take place at the Greenfield, Cemetery Arthur. As expressions of sympathy donations to the Louise Marshall Hospital Auxiliary or the Gordonville Presbyterian Church would be appreciated by the family.